The strength of Geoff Johns's DC Comics New 52 Aquaman debut is not, as many have suggested, Johns's positioning of Aquaman as a "joke" in the DC Universe as he often is in the real world, acknowledging and moving on from this -- though to be sure this is a clever aspect of the book. Rather what stands out in Aquaman: The Trench is Johns's humanizing of the character, emphasizing for the first time in a long time the Sea King's human, land-locked origins. The book's initial story is somewhat thin, and there's some tricky moral questions Johns doesn't quite address, but Johns and artist Ivan Reis are a powerhouse team, offering an engaging, attractive comic that more than overcomes its shortfalls. What distinguishes Aquaman: The Trench as a real Aquaman relaunch is Arthur Curry's decision, in the first chapter, to abdicate the throne of Atlantis and build for himself a life on land with his wife Mera (and later, their new dog). He is spurred on by the memory of his father, a lighthouse keeper, who "stay[ed] on land … to watch the shores." Arthur, via Johns, notes that he was thirteen the first time he saw an Atlantean; in essence, Aquaman is Atlantean in the same way Superman is Kryptonian -- by nature but not necessarily by nurture. This is significantly far away from the Aquaman of late, in comics and cartoons, who barred other heroes from superheroics in "his" seas. Suddenly Johns has given the reader an Aquaman whose adventures happen on land with significant reason, instead of needing to find occasional excuses for Arthur to just "happen" on the shore. Also, by taking Arthur out of the court politics far away in Atlantis, Johns makes Aquaman feel more like a proper part of the superheroic DC Universe; Peter David's Aquaman was mature and detailed, but it was also easy to ignore when events on the mainland never affected Atlantis and vice versa. Johns's Aquaman, again like Superman, feels accepted by neither of his dual heritages, though Arthur, unlike Superman, is actually half-human (The Trench is vague on this point but it appears to be the case). Whereas people on land ridicule him, however, Arthur points out that the Atlanteans have actually tried to kill him (despite that they later made him their king); this cements Arthur's decision to essentially renounce his oceanic origins and live his life as entirely human. But a ghostly apparition of Arthur's father in the fifth chapter taunts Arthur that he's still terrified that he doesn't fit in on land, either -- the sheer appearance of his father acting brutally, when Arthur's memories of his father throughout the book have been peaceful, underlines Arthur's true insecurities that the people on land might reject him. Johns presents Arthur's disquiet, in essence, through his quietness. Aquaman is a character who doesn't say much, and whereas he's considerably violent against the sea monsters who attack the land from the titular Trench, his fight against bank robbers seems to use no more brutality than is absolutely necessary. When Arthur must ultimately commit genocide against the Trench-dwellers in order to stop them, he does not even share his guilt with Mera; rather he broods silently, and the reader only sees Arthur's thoughts reflected wonderfully by Reis in the pouring rain outside a window. Johns's Aquaman comports himself something like an abandoned child -- he seems to strive not to make a fuss (again, a significant departure from Aquamen iterations past) so as not to face another rejection. It's unfortunate Johns will leave this title around the end of the next collection; the temptation for the next writer to abandon Johns's complex characterization of Arthur and revert to the "angry Aquaman" of years past will probably be great. All of this complexity makes up for what is a thin Aquaman story, plot-wise. Johns holds back any of the major Aquaman villains like Black Manta and Ocean Master for now; instead, Arthur and Mera save Amnesty Bay from the near mindless sea creatures that emerge from the Trench. Aquaman's decision to commit genocide against the creatures is startling; however, most of the first four issues is taken up with introducing Arthur's status quo, with only the fourth issue focused on the Trench-dwellers straightaway. 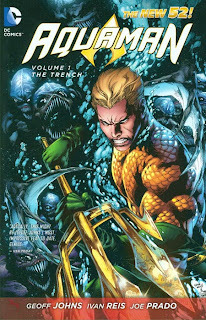 If not for the ocean setting, Trench could be the story of Superman fighting alien invaders as much as Aquaman fighting sea creatures. The fifth and sixth issues, focused on Arthur and Mera alone respectively, are fine, but equally as thin. Johns takes an "Aquaman in the desert" story and turns it unexpectedly to a revelation about Atlantis; this is better than the Mera issue, where she stumbles around, breaks local laws, and the reader is reminded heavy-handedly that she's "not from around here." But this early in the series, and with only two protagonists, Aquaman doesn't need profile issues, and it seems as though Johns is simply biding his time before the next multi-part epic. What differentiates Aquaman in the end from someone like Superman is that Arthur does, indeed, commit genocide. This, along with his filleting of a Parademon in Justice League: Origin, reflects a certain extra brutality that many incarnations of Aquaman (and, say, Hawkman) have had. It is not unexpected, though wiping out an entire species seems unusually harsh. In what time he has left, Johns will hopefully explore these issues and not treat them as a matter of course; especially as pertains to the DC New 52, the reader deserves some illumination as to what does and doesn't pass for each heroes' morality in the new universe. Aquaman: The Trench is a strong rebirth for Arthur Curry and enough to whet the reader's appetite for good things to come; it's only a shame there's not more here to tide over the reader until next time. Coming up next week, the Collected Editions reviews of Demon Knights and Batman and Robin. Thanks for the review. I read this collection last weekend and also liked it. But man, it was a fast read. I think it was the first of the new 52 books that I read in one sitting and in under an hour! I would have liked to see johns stay on this one for a long run like flash or green lantern. Unless they get a similar big name or critical darling to follow him then sales will just drop and the book will once again be canceled. aquaman is a difficult character to write well and to make interesting. I would love tomasi or lemire to take over. Sounds like a great and decent reboot! For me, Aquaman is one of the big hits of the New 52 - fresh take on a character (which you correctly identified with the giving-up-Atlantis moment), great creative team, clear identity away from the big hitters, and just plain fun to read. I agree that it's not a substantive book yet (we'll see how "The Others" plays out), but it's one I look forward to every month. It does have the Johns-iest beginning ever, though, with Johns quite literally saying in the first issue, "You are so wrong about this character that I love, and here's why." I'd roll my eyes if it weren't so darned effective. No, please not Lemire! I am liking him far too much doing what he is already doing. Animal Man is my favorite of the new 52 (along with Flash & All Star Western) and Justice League: Dark has taken some big steps in the right direction. Now that Sweet Tooth is about to end, I think Lemire could fit a third DCU book in his schedule, but the fact that he's got a co-writer on Justice League Dark #15 is a bit suspicious. Jeff Lemire said in a Comic Con clip he would like to do Aquaman. And with what Shagamu saying Sweet Tooth is coming to an end soon (which it is), then that leaves some space for Lemire to take over. But I do agree, keep him on Animal Man and JLD. Aquaman needs a big name writer to do 2 to 3 years worth of great stories for Arthur, just to solidify his position among the A-tier characters. Otherwise people will just see Aquaman as a guy who go 15-minutes of fame from Johns and Reis. But overall, the review hit the target for vol.1. It's good. Maybe not great, but it's worth checking out. I really enjoyed the first six issues of this series. I've never been a big Aquaman man, but after enjoying his story in Brightest Day, and with this creative team, I was willing to give it a chance. Glad that I did. It kind of reminded me of the early issues of the pre-New 52 Green Lantern series, with Hal returning to a rebuilt Coast City and re-establishing his status quo (which didn't last that long - how long since Hal's spent any time at home?). I'll stick with Aquaman until Johns leaves (barring a severe drop in quality). The latest solicits have him doing a JL/Aquaman crossover at least through issue #15, so maybe there'll be 3 trades worth of Johns' Aquaman stories, and enough of an established baseline for another writer to work from. With the Justice League/Aquaman crossover, this reminds me of when Goeff Johns left Hawkman, ending his rum similarly with a crossover with his other title, JSA, in Black Reign. Good story, though Johns left a number of threads untied in Hawkman, never to be revisited again. That's my concern and what I hope doesn't happen here. I agree the Aquaman title needs a good long run by a writer, to solidify this depiction of Arthur; this could just as easily go wrong if the next writer flubs it. Tomasi is a good suggestion, but then I'm pretty high on just about everything Tomasi writes these days. Once upon a time I really wanted DC to collect the "Sub Diego" issues of Aquaman by Will Pfeifer (with art by Tomasi's often co-creator, Patrick Gleason); I liked Pfeifer's HERO and Catwoman -- I think he's out of comics now, but that's another potential replacement who came to mind.